Summary:Plenty of teenagers feel invisible. Fiona McClean actually is. My Thoughts: This was a weird one but in a decent way. We are introduced to Fiona who has a mother, father, and two older brothers. One brother she trusts all the way, the other not so much. Fiona is used to doing her father’s dirty work but she’s sick of it. Its pretty easy to do it when she’s invisible and nobody can see her coming, well as long as she’s naked! Fiona and her mom decide they are going to leave and start over somewhere. So off they go to a small little town. She finally gets to be free. But people in this town know her. She’s invisible and everyone knows who she is. Well, people can still see her clothes. So, she always has to look stylish at least. Or at least comfortable. She meets a group of friends including boys named Seth and Brady. I liked Seth from the get go. He came off as a jerk but I knew deep down he was a great guy. She also meets a friend named Bea. Bea was instantly there for Fiona and became a great friend. While her dad is looking for her, Fiona has to try to stay hidden as much as possible. I want to give a big spoiler away regarding Seth but I won’t. I want to jump up and down and scream it! When you read the novel, you’ll know what I’m talking about! 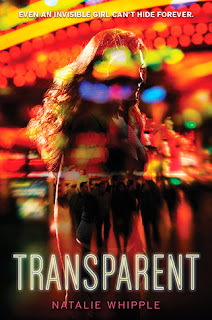 Transparent was a little weird for me at first but I ended up really enjoying it. The first few chapters were harder to get into, and I felt myself wondering what the heck is going on? It was unique to say the least. I haven’t really read anything like this one. I also liked the plot and the characters. Overall: I really enjoyed it, and if there are more in the series, I will be reading them! Very adorable characters and a neat plot. Cover: Like it! Its very bright and neat! The invisibility was so weird but I found the writing very easy to read so I liked checking it out. Have you seen the British cover? I actually like that one more.